Being that I will be at NFL Training Camps nearly every day, I want to take a few moments each day to break down a new player or two that I am relatively unfamiliar with (i.e. a guy that I haven’t worked with before). So in addition to the time that I am spending there analyzing my own players I am going to put out some content including insight regarding what types of things I am see popping out at first glance with some of these other guys. It should be noted that most of the time I would extensively dissect player’s movement during game analysis which would include frame-by-frame breakdown to truly get an idea of what’s happening when he moves. Thus, I am going to likely miss a lot with these very brief evaluations based on my visual analysis of the guy playing live. Obviously, with the extent of detail that I usually go into with analysis of a player’s strengths and weaknesses, if I was doing this in preparation for working with the guy I would take the time to watch an extensive amount of game-film to see him play in multiple situations. This will be a limitation during camp practices as there are only so many plays that you get a chance to see from each guy. For the opening of training camps, I have spent each day in Mankato, MN for the Minnesota Vikings camp. For next 2 days, I decided to travel to the Viking’s next door neighbor rival in WI, the Green Bay Packers. Getting to see only 1 true practice, I obviously couldn’t spend a significant amount of time breaking down multiple players but I wanted to give any interested readers more insight on the team as they do have some interesting athletes across this roster. Luckily, of 2 of the players that I plan to evaluate (Clay Matthews and Randall Cobb) I have already taken some time to get to know them during the offseason by viewing their film (even though neither one is an athlete of mine). I do this frequently simply because I am intrigued by some of the movement that they have displayed in the past when I have seen them make plays on Sundays. 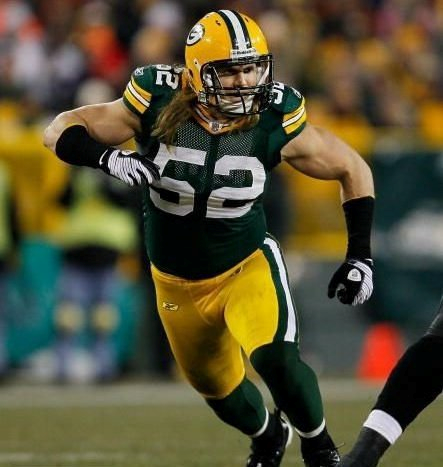 Today, I will start with All-Pro, All-Everything, Linebacker, Clay Matthews. Any trip to Lambeau Field that entails live football would be incomplete without giving rightful justice to #52. 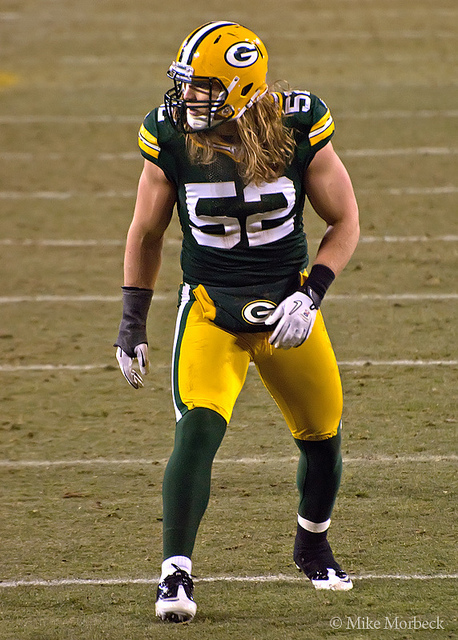 Unlike Chad Greenway who BTS evaluated last week at training camp, anyone who seriously watches football already knows who Clay Matthews is. Some of this comes from his freak athleticism and game-changing playmaking, some of it because he got paid straight-cash homie money in the offseason, and some because of his personality and unique look that has given him significant TV time. Though I am only a year removed from having long-flowing locks that some would argue would rival 52’s (no one would say about my hair, at all), I am not here to give any analysis on that piece of who he is. Instead, I will talk about the former because that is something I am actually an expert in (his unique athleticism). To start, one look at his trademark flexing post-big play celebration and you quickly realize we are talking about a different breed of athlete here. He presents a special blend of speed, size, and strength that is immediately noticeable to witnesses. He flashes off of film (or to the eye in person) as soon as a ball is snapped (and even sometimes before). Like many of the hybrid outside backers playing in the league today, he is not asked to do many of the things that most other LBs across the league who play in more traditional defenses are required to do play-in and play-out. Instead, the defensive scheming by the Packers defensive staff really allows him to show off his strengths which revolve around go hunting by allowing him to be put in positions to show off by frequently running people down (esp. quarterbacks and much lighter runningbacks). His explosive linear burst for someone his size is unparalleled among his peers in the league. 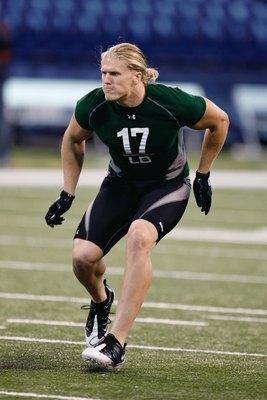 I don’t know what his combine times (not the 40, you fools…more like the 10!) were back when he entered the league but I would be more interested in his current (during game) 3 to 7 yard distance times. I believe that these quantitative figures would blow people’s minds if compared to others in similar roles across the league. Something else that should blow people’s minds (at least it boggles mine) is how he is able to display this type of explosive power when he sometimes puts himself into positions which one would expect some energy leakage to occur during. Of course, we expect any top athlete to display some degree of compensation even in the movement patterns that he has to perform very frequently on Sundays. This is only natural and more prominent in sports that involve nothing but chaotic and complex motor actions. However, in my opinion, it’s up to us as movement specialists/trainers/coaches to distinguish between those things that can be labeled compensations that represent a certain degree of inefficiency versus those compensations that are dysfunctional. There is a big difference there! Compensations w/inefficiency can be worked on day-by-day through a continual process while knowing that this type of compensational movement pattern is still one that may actually allow the athlete to be who he is. In contrast, compensations w/dysfunction needs to be fixed as soon as possible. When I start with an athlete, one of my first items of business is categorizing those things in an athlete’s predominant movement patterns and then determining which of those is worth it to try to change. I do believe that optimizing efficiency is the key to maximizing performance. However, you must pick your battles. In addition, some things represent bigger challenges than others depending on the individual-by-individual circumstances. Nonetheless, as a football movement specialist, one of our main points of emphasis should be a constant pursuit of maximum on-field movement efficiency. A lack of efficiency will result in not only energy leakage (and a detraction of performance such as less power/force being directly applied to the ground) but also a drastic increase in the likelihood of injury due to compensations in both biomechanical efficiency (i.e. positions) and neuromuscular efficiency (i.e. what muscle is firing at what time to control movement). Sometimes athletes perform at a high level in spite of these compensations in the movement patterns; sometimes they don’t…and sometimes it’s only a matter of time till they rear their ugly head. I believe this is where a lot of 52’s hamstring issues in the past have stemmed from. Now, I haven’t followed his career year-by-year but I am aware that he has seemed to be affected by nagging annual hamstring issues that appear to pop up consistently on an annual basis including missing a number of games last year. Granted the dude puts out a ton of concentric power and exerts that force to the ground in a quick hurry. But it’s astonishing to me that no one has investigated and then adequately addressed this relatively major issue (especially with its chronic nature). If a guy is potentially worth 60-some million dollars then one would think it’s worth it to take care of something that could keep him from earning every dime of that. Of course, as we try to make the invisible (the cause of the effect aka the nagging hamstring) more visible, there is a laundry list of things that could potentially fit that bill. In my humble opinion, the Packers have one of the better S&C programs that I have seen across the league. But the fact of the matter is that S&C Coaches in the League don’t get the opportunity to make many major changes to the team’s athletes anyway with how little time is allotted to them (because of the CBA from 2 years ago). If a change is going to occur, it’s more likely that the other people in his life that are in charge of preparation will need to make it a reality. I understand he has been known to participate in a fair amount of MMA-type training with Jay Glazer’s group in the offseason when away from the team facility (or at least he has often been linked with this). There is something to be said about the use of MMA for football performance. It can help add control to common violent movements of the sport, etch in some solid general work capacity (i.e. conditioning), as well as help to link the upper body with the lower body in movement. I believe that the MMA training has helped him significantly when enduring contact; he is able to maintain stability and put power to the ground to keep guys moving back on their heels (and him moving past them) maybe as well as anyone you will see rushing the quarterback from the edges. All that said if there is too much emphasis on MMA-type training (at the expense of other more specific/specialized training methods) it could also have a great deal of limitations to it. As an umbrella thought, it can teach/train an athlete to move in ways that aren’t exactly the same as the ones he will have to endure to play his sport to its utmost potential. In my thoughts, when we are talking about an athlete at a high level of mastery (who then possesses very specific weaknesses and considerations) as well as one who plays at the highest level of qualification (NFL Pro-Bowler), all training performed should directly be done to enhance the athlete in the most specific ways that he will need to perform his sport demands. Simply put; the way that the athlete moves in an octagon is NOT the same as the way he moves on the gridiron. In addition, previously strained hamstrings will lack power as well as have changed length-tension & then force-coupling relationships (again, all of this changes the way that the athlete displays movement which puts him further behind the 8-ball). This is especially true during the rapid eccentric muscle actions that will occur out on the football field (so that means if they go unaddressed they will remain susceptible). In addition, knowing that the hamstrings are biarticular (i.e. they cross both the hip and the knee), this means that the range of motion especially into hip flexion will also be changed because the body will outsmart itself by trying to avoid re-injury by subconsciously decreasing the degree of hip flexion that the athlete will display in most patterns (Note: the LB position is all about flexing and extending the hips explosively). You can see this change in positioning (whether it is conscious or subconscious, taught or involuntary) in 52. He sometimes is caught very high in positions with both his hips and his knee lacking significant flexion (and therefore they are also ‘unloaded’ or ‘unstretched’). This causes a cascade of events in which he keeps his shin vertical (some could be the fact that he has a very long tibia to begin with). He can often be found in dorsiflexion in most movement actions (that’s typically a good thing) but sometimes strikes heel first because of that long lower leg structure. He therefore needs to rely on a great deal of concentric power from his knee extensors which luckily for him he puts out a ton of. In addition, his lower legs have some energy leakage issues themselves. To start, he is found with a toe-in action during absorption way too much for my liking that seems to occur on both sides (though I am going off of limited reps here). In addition, pre-foot-strike, his lower leg doesn’t seem to have a lot of pre-stretching/pre-activity which results in some energy dissipation once his foot hits the ground. Just a quick look at some of his highlights from last year gives me indication that there are times that his foot will both overly supinate or pronate (this is a unique thing to witness from case-to-case) immediately prior to the foot touching the ground which can cause the foot to collapse (and the line of force to roll one way or another) under rapid absorption and change of force application. Of course, this can be really hard to speculate what this comes from because the sport of football because the demands of the game may change both biomechanics and neuromuscular considerations each repetition. This is unlike in sprinting or a similar sport discipline where we can easily see what’s happening each and every time the athlete executes the movement in the exact same fashion. I believe that most of these issues are being caused from his motor potential (i.e. in his case lack of hamstring strength or activation) and being exacerbated by his current movement compensation patterns. It could also be a chicken or the egg type case with him. In any event, I feel as though they are things that could be/should be addressed at some point for him. If that would happen, CM-52 could actually move faster and more explosively than he currently does (scary thought, I know). 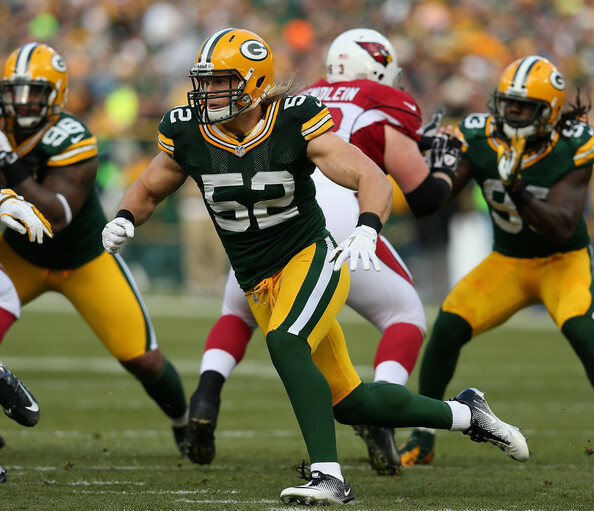 All in all, though it may seem as though I am being very critical of Clay Matthews and his on-field movement patterns this really isn’t the case. He is still a freak of nature and he likely will remain at the top of the totem pole at his position for years to come. My point is that even the best at any position still need to improve and I wanted to point out a few of those things that I feel could actually make him better!